OMG, I don’t know what I need to do before my boudoir session! You’ve searched all over the internet to figure out what you need to do to prepare for your boudoir session, am I right? You’ve looked for the perfect boudoir checklist to make sure you are ready when your big day rolls around, only to be left more confused than when you started. A boudoir session is all about self-love and body positivity, and it is for every BODY, every woman. Think with me now: what are the reasons for getting in front of the camera, in lingerie or your birthday suit? You want to feel empowered, bold, and most importantly, CONFIDENT. 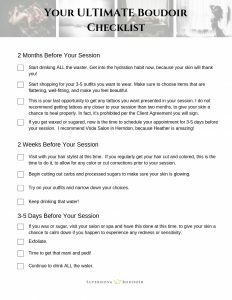 The Ultimate Boudoir Checklist will walk you through the perfect timeline to make sure you are totally ready and excited about your boudoir session! The very first thing you need to do is stop worrying! You are in good hands with Supernova Boudoir. We are going to primp you and pose you, from your eyelashes to the tips of your toes. All you need to do is use this handy checklist to make sure you are completely prepared for your epic day! Start drinking ALL the waster. Get into the hydration habit now, because your skin will thank you! Start shopping for your 3-5 outfits you want to wear. Make sure to choose items that are flattering, well-fitting, and make you feel beautiful. You can hit up places like Frederick’s of Hollywood, Le Bustiere in Washington, D.C., Rigby & Peller in Tyson’s Corner, Forever 21, Hips and Curves, Best Rack Around in Leesburg, or even Amazon [affiliate link]! This is your last opportunity to get any tattoos you want presented in your session. I do not recommend getting tattoos any closer to your session than two months, to give your skin a chance to heal properly. In fact, it’s prohibited per the Client Agreement you will sign. If you get waxed or sugared, now is the time to schedule your appointment for 3-5 days before your session. I recommend Voda Salon in Herndon, because Heather is amazing! Visit with your hair stylist at this time. If you regularly get your hair cut and colored, this is the time to do it, to allow for any color or cut corrections prior to your session. Begin cutting out carbs and processed sugars to make sure your skin is glowing. Try on your outfits and narrow down your choices. Continue to drink all the water! Check out Mrs. J’s Bold and Fearless Boudoir Session on the blog! If you wax or sugar, visit your salon or spa and have this done at this time, to give your skin a chance to calm down if you happen to experience any redness or sensitivity. Time to get that mani and pedi! Continue to drink all the water. Keep drinking that water. You are a mermaid. Make double-sure your outfits fit and you want to wear them. Pack your bag with outfits, shoes, and any accessories you want to bring. Wash and blow out your hair right before bed. This is especially important if you have fine hair, so it holds a curl or wave the next day. Get a good night’s sleep! Nobody likes dark circles in photographs. Start your day off with a big glass of water. Eat something light but filling. Trust me, you’re going to burn it off. I promise! Wear comfortable, loose clothing prior to arrival at Supernova Boudoir to prevent lines on your skin. I recommend coming braless! You can change privately here. Make sure you leave with plenty of time to arrive, because #traffic. See all the fantastic images from this Best Friend’s Glamour Session. DON’T spray tan or tan in a tanning bed prior to your session; you should come with your skin looking as natural as possible because that’s when it looks its most beautiful! Spray tans also don’t photograph well and turn out a really orange in camera. DON’T try out a brand new cut or color before your session. Stick with what you know you love! DO get outside your comfort zone with at least one outfit. You never know, it might turn out to be the set you love the most, and in fact, most of our clients’ favorite images are the ones outside their comfort zone! DON’T worry about being nervous; everyone is at first! Need a pinnable guide? No problem! Download it right here.